So a new arc of the Dragon Ball Super manga started called the Galactic Patrol Prisoner Saga , and a new villain appears called Moro. In both this manga arc and in Dragon Ball Super Broly, Goku lost the hability of turning into Ultra Instinct (actually, he never mastered the transformation at will) so it's difficult to know if it happens after or before the Broly movie. Does the Galactic Patrol Prisoner Saga where Moro appears take place after or before the Dragon Ball Super Broly movie? It is set after DBS Broly. 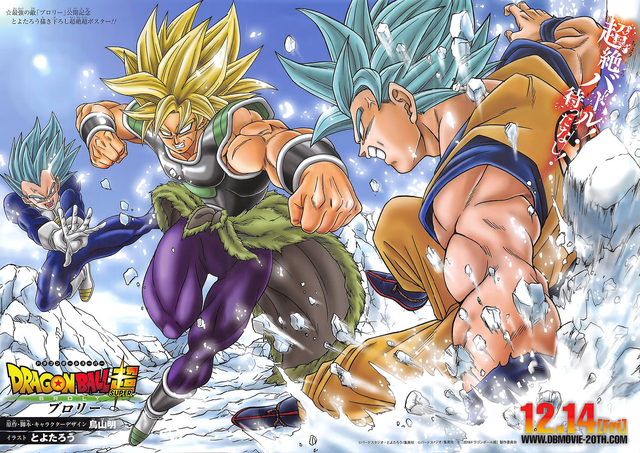 There is a short summary of the same at the end of, Manga Chapter 42, where there is an image of Super Saiyan Broly fighting Mastered Super Saiyan Blue Goku and Vegeta. Since this arc was released before the movie, it obviously doesn't go into details to avoid spoilers. I have included a colored picture of the same below. Not the answer you're looking for? Browse other questions tagged dragon-ball-super dragon-ball-manga dragon-ball-movies or ask your own question. Why Goku and Vegeta didnt use Super Saiyan Blue Kaioken and Super Saiyan Blue Evolution to defeat Broly? Is Akira Toriyama involved in the new Dragon Ball manga arc?